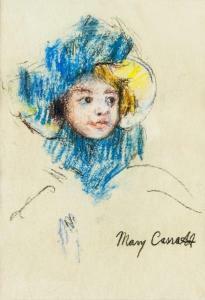 Find artworks, auction results, sale prices and pictures of Mary Cassatt at auctions worldwide. 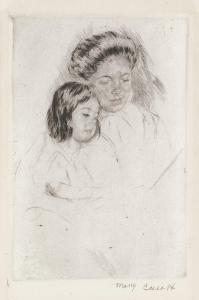 Mary Cassatt American Modernist Pastel on Paper American school, pastel on paper, framed. Featuring a portrait of a woman in a bonnet. Signed Mary Cassatt on the lower right corner. 25.5 x 17.5 cm (10 x 6.9 inches). Frame size: 45 x 34.5 cm (17.7 x 13.6 inches). PROVENANCE: Southern Ontario estate Mary Cassatt was an American Impressionist painter best known for works depicting mothers with their children such as The Boating Party (1893). Cassatt was a determined artist who achieved critical and commercial success at a time when few women painters were taken seriously. \“I have touched with a sense of art some people—they felt the love and the life,\” she once said. Born on May 22, 1884 in Allegheny City, PA, Cassatt traveled throughout Europe at an early age. There, she developed her interest in art and went on to spend much of her adult life in Paris. She participated in numerous early exhibitions of Impressionist art, and maintained a long friendship with Edgar Degas. Like Degas, Cassatt\’s work never wholly broke with tradition, but rather assimilated some of the characteristics of Impressionism into a realistic style. The artist died on June 14, 1926 in Paris, France. 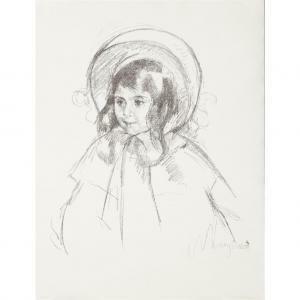 Today, her works are found in the collections of the Art Institute of Chicago, the Musée d\’Orsay in Paris, The Museum of Modern Art in New York, and the Carnegie Museum of Art in Pittsburgh, among others. MARY CASSATT The Picture Book (No. 1). Drypoint, circa 1901. 220x150 mm; 8 3/4x5 7/8 inches, full margins. Second state (of 2). Signed in pencil, lower right. Vanderley watermark. A very good impression of this scarce print. We have found only 9 other impressions at auction in the past 20 years. Breeskin 176. US Impressionist Pastel Signed Mary Cassatt Pastel on paper, framed. Featuring a portrait of a girl. Signed Mary Cassatt on the lower right corner. Stamped on the lower left corner. On verso, two labels. One label inscribed ARTIST-CERTIFICATE, U.S. Consulate General AT PARIS (FRANCE) / Mary j Cassatt being duly sworn, deposes and says that he is an American citizen and an artist temporarily residing in Paris. that he is the author of the _____ mentioned and escribed in the foregoing statement, and that _____ the work of his own unassisted hands \ Signed with signature Mary J. Cassatt / Sword and suscribed to this 28 day of July AD 1876. Another label on verso inscribed HIRSCHL & ADLER Galleries inc. / 21 East 70th Street. 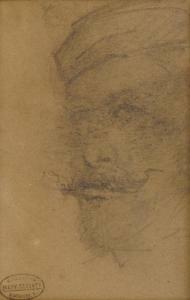 New Yorko, N.Y. 10021 / ARTIST: Ma RY CASSATT / NUMBER: P4536 / TITLE: Portrait / MEDIUM: Pastel on paper / Size: 10.75 x 8.75 / DATE: c. 1876. 27 x 22 cm (10.6 x 8.7 inches). Frame size: 46 x 41 cm (18.1 x 16.1 inches). PROVENANCE: Hirschl & Adler Galleries Inc. (c. 1876) Acquired by current owner (New York, United States, circa 2000s) Mary Cassatt (1844-1926) was an American Impressionist painter best known for works depicting mothers with their children such as The Boating Party (1893). Cassatt was a determined artist who achieved critical and commercial success at a time when few women painters were taken seriously. \“I have touched with a sense of art some people—they felt the love and the life,\” she once said. Born on May 22, 1884 in Allegheny City, PA, Cassatt traveled throughout Europe at an early age. There, she developed her interest in art and went on to spend much of her adult life in Paris. She participated in numerous early exhibitions of Impressionist art, and maintained a long friendship with Edgar Degas. Like Degas, Cassatt\’s work never wholly broke with tradition, but rather assimilated some of the characteristics of Impressionism into a realistic style. The artist died on June 14, 1926 in Paris, France. Today, her works are found in the collections of the Art Institute of Chicago, the Musée d\’Orsay in Paris, The Museum of Modern Art in New York, and the Carnegie Museum of Art in Pittsburgh, among others. MARY CASSATT (american 1844–1926) "SARAH WEARING HER BONNET AND COAT" Circa 1904. Lithograph on laid MBM Ingres d'Arches paper Image size: 20 x 16 1/2 in. (50.8 x 41.9cm) Sheet size: 24 3/4 x 18 3/4 in. (62.9 x 47.6cm) [Breeskin 198] provenance: Yamet Arts, New York. Private Collection, Pennsylvania.